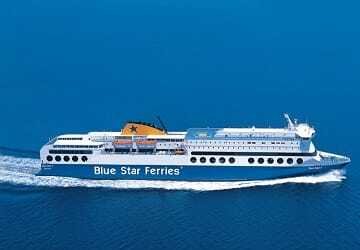 Being able to carry up to 1890 passengers and 641 vehicles the Blue Star 1 is one of the leading ferries of their fleet. Fully air conditioned throughout, Blue Star 1 provides a pleasurable environment for you to enjoy all of its onboard facilities such as its gift shop, open deck café, video games room, a self-service restaurant, a la carte restaurant and more. Blue Star 1 offers all the usual type of cabins you would expect onboard a ferry of its calibre with both inside and outside options as well as disabled and pet friendly versions. However additionally to these they offer a unique class of cabin called “PURE CABIN”, PURE cabins are treated with a cutting edge process that purifies the air, providing the ultimate comfort level for those sensitive to airborne particles such as asthma and allergy sufferers. Please Note: Whilst we have taken great care in making our Blue Star 1 guide as accurate as possible, onboard facilities, services and entertainment may vary depending on the date and time of year that you travel, facilities mentioned may change without notification and ferry companies reserve the right to operate vessels other than those mentioned at time of booking without prior notification. My wife and I were very impressed with the service provided by Blue Star Ferries on our recent trip between Lesbos and Chios. The ferry left on time - maybe even a couple of minutes early - and everything onboard was very comfortable. 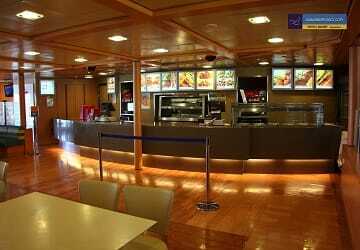 "Blue Star overnight ferry from Chios to Piraeus "
Very large and well managed ferry. Warm and comfortable with lots of different areas to sit in, including a couple of cinema areas. We (x 4) booked a cabin which was very clean and surprisingly roomy. Beds very comfortable - we all slept well. One of my companions had a shower and was very happy with it. We did not buy food or drink so cannot comment; and did not have much contact with staff although those we did were patient (it was very busy) and competent. Ship arrived in Pireaus early; we were on the far side of the harbour but caught the free bus transfer round to the town side of the harbour; patisserie cafe between the harbour and the railway station was open very early. All in all an easy and very comfortable crossing. 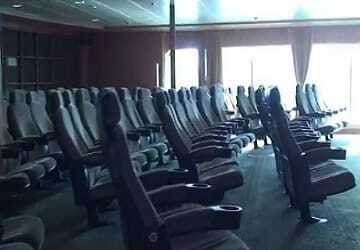 The ship was great, we had not booked a berth but there was plenty of room and comfortable chairs to sleep in. 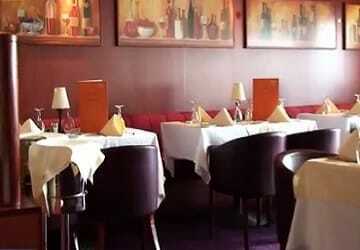 The staff were really helpful and the public areas and toilets were very clean. I would use again. 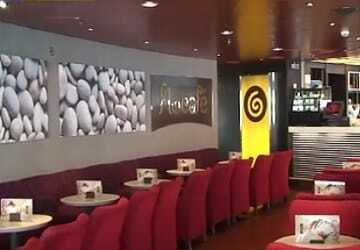 Travelled from Mytilene to Piraeus on this fantastic ferry! 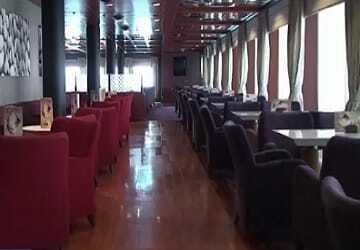 Spotless, luxurious with amazingly friendly and helpful staff.. great restaurant and a cruise ship atmosphere. Seriously.. the trip with cabin, cost about 40% less than an air ticket and gave us the time to ease slowly into the shock of Athens. One of the best sea trips ever. 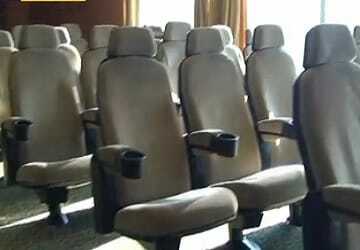 Everything went smoothly, comfortable seating, friendly and proper treatment by staff. All this made the crossing very enjoyable. This made us happy with our choice. "On the way to Patmos"
My trip with Blue Star Ferries from Piraeus to Kos and then later from Kos to Piraeus went very well. The boat departed and arrived in time in both directions. The staff onboard was very friendly and helpful and the boat was well equipped, clean, neat and modern. The only thing that annoyed me was that it was so expensive to buy a private cabin. The trip overall could've been cheaper since I didn't travel during the high season. The airplane chairs were good though, you could get some rest. What was most unfortunate for me was that there were so few ferries between Piraeus and Patmos (that was my end destination) during low season, so I had to travel via Kos and then wait for the catamaran that took me between Kos and Patmos. On the other hand I got a nice trip between the islands! Despite the ferry we took wasn't the best Blue Star vessel, we had a pleasant trip. all good, departure on time, free wifi, clean toilets. The crossing was great, the cabin was very clean, comfortable and super clean bathroom. I would totally recommend. "Blue Star voyage Rhodes to Santorini"
When you are going to get the tickets in the Blue star offices at the port, they charged one euro for the issue of the tickets, this is something that is not indicated anywhere when you make the purchase and at the moment of boarding is not well indicated the ferry that you have to board, only when you are inside the ferry someone check the tickets and told you if you are in the right ferry or not. 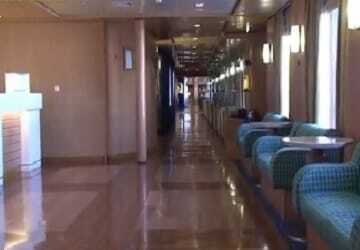 Clean and comfortable ship. Self service restaurant with good prices but the bar is definitely too expensive. I can't recommend to book the reserved seat in the lounge room, because it's not comfortable. Booked a room - extrememley comfortable (great shower and bed). Will definitely travel this way next time. It was an excellent trip on the Blue Star boat between Santorini and Kos. Been on a few Greek ferries and this one was at least as good as my previous experiences.